Lord Lawson School was the new venue for the Cathedral relays and it appears to be a great choice. Ken drummed up five teams for the men and our over 55 golden – well, bronze – boys ran their way to a podium finish. 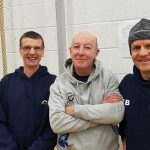 Excellent work by Ken, Bill and Richard – and a special mention to Ken, the fastest oldie over 55 in the whole field! M55 B squad, Michael, John and Ray, finished 6th in their category. 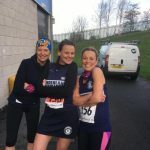 Jan, Nicola and Suzanne made up the ladies team, well done girls! First Strollette team – gotta be in it to win it!